While a roof drainage system is designed into flat roofs, commercial building owners continually are confronted with ponding water on their flat roofs. The cause can be sagging, blocked roof overflow drain pipe, clogged roof drain filter, or failure of any roof water diverters. But regardless of the cause, a flat roof water pump can remove the excess water and deter roof system failure. A flat roof ponding pump is a small investment to remove ponding water from your flat roof. That is as long as the power to the building is functioning. Often severe storms not only deliver excess water to area roofs, but also cause power outages at the same time. This leaves the roof system at the mercy of heavy ponding water. The solution is to install a solar powered roof pump. They are powered by a battery which is continually charged by a solar panel, to maintain full charge. When called upon, the unit will pump water for hours - removing standing water from the roof. These sturdy, technologically-advanced units are easy to install. The require no hole drilling and can be up and running in about 15 minutes. 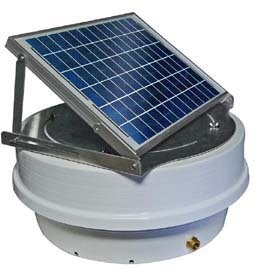 Once installed the Sentinel Solar Roof Pump stands ready to drain roof water away from the roof into the roof overflow drain or down gutters. If The battery loses charge during an extended storm, the unit becomes a siphoning roof drain system and continues to remove water from the roof. The Sentinel II Solar Roof Ponding Pumps have the new Dupont® powder coated surface keeping the smart chip technology insulated from the damaging heat and UV degradation of the atmosphere. Our original model! Rotatable over-sized 20-watt proprietary solar panel. Smart chip technology and cold Weather protection. 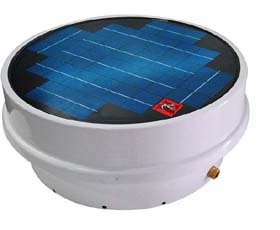 Is a stationary unit with the solar panel embedded directly into the spun aluminum casing. Great for wide open areas where remote panels are not required. Has a lower center of gravity and has less of a wind up lift issue than the raised solar panel.